Jason Gray is inevitably rising to become one of the more passionate and creative worship leaders in Christian music today. And it is no wonder, his music bears something intimate while still striving for creativity and something that would permeate in the listeners ear after it's all done. Usually live albums are a major downgrade compared to listening to the studio recording. 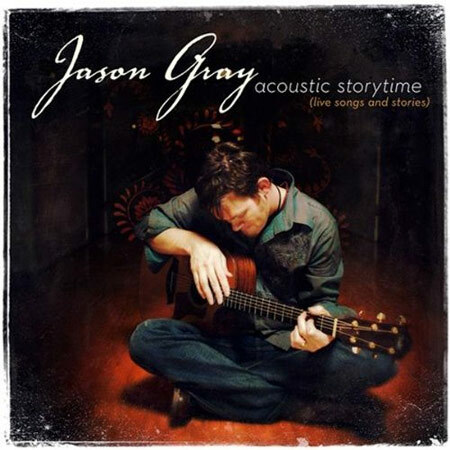 Jason, however, by packing Acoustic Storytime (Live Songs and Stories) with deep messages and intimate and even funny moments, manages to make this album well worth the buy just as much as his studio albums. Silence is broken with the a capella premiere of "Down To The River." This song feels strangely personal, enchanting, and displays an image of a kind of river we all are confronted with in our lives. After the song, Jason Gray introduces himself with a stage charisma that seems natural and is actually very comical. He then begins the second song in the set, "This Far," off his debut All The Lovely Losers. Jason has a stellar live voice and guitar precision that sounds almost identical to anything that he might have recorded in a studio. Once this song is over, Jason proceeds by announcing his speech handicap of studdering. It's quite an inspiring testimony that might make you admire the guy more than you might have already. The entire album is layered with stories and teachings from Jason's life. The teachings are profound and intense, so much that even if music was absent from the whole album, you still might want to give the teachings a listen. As it is, that's not the case, since the live album is bundled with fourteen songs among the twenty two total tracks. "Blessed Be" is next, with an unexpected surprise song toward the end, once again displaying his outgoing and free spirit. After this, he explains a short story about his following song, "The Cut," which is one of the more powerful songs he has to offer. Acoustic Storytime is one that must be approached with time and an open heart, because even the songs, in a way, seem like teachings. Following his song "Not Going Down," Jason covers Tom Petty's hit song "I Won't Back Down" and does a great job with it. He plays with the idea of innocent love in his song "If I Were a Dog," somewhat giving the album a nice range of freedom. The live venture ends with two studio songs, which threw me off at first. They're both good songs, just seem disproportionate. In the end, Acoustic Storytime is probably one of the more intimate live albums I've heard in a long time. If you have a few spare minutes to receive something deep and inspiring, give this album a listen.